Mumbai, known for its nightlife and fast-paced living, is also home of some wonderful landmarks. The financial capital of India is a haven for those who love touristy sightseeing, with iconic structures and historic locations dotting the city. Here are our picks of the top tourist places in Mumbai you need to see on your next visit. The Gateway of India was erected to commemorate the arrival of King George V and Queen Mary in Mumbai. Check out the lovely Roman triumphal arch in the centre of the structure and the lovely designs on its walls. From the Gateway, you can catch stunning views of the iconic Taj Mahal Palace hotel that is just opposite the road. The place is safe to visit at night and, during the day, you can catch a short boat ride from here. The Mumbai Port Trust Garden or Sagar Upvan is probably one of the most scenic gardens in Mumbai. Surrounded by greenery, the pathways at the garden are flanked on either side by old trees. The garden boasts a variety of medicinal and oriental plants as well as a few cacti. There is a rock garden here, too. The St. Thomas Cathedral on DN Road is one of the oldest churches in Mumbai. The church was built in true neo-gothic architectural style with tall pillars. In the church you will find many epitaphs of soldiers who died fighting in the war, as well as beautiful stained glass windows. At this Anglican cathedral you will also find a memorial dedicated to the first bishop of Mumbai. One of the most famous places in Mumbai. The Mani Bhavan Gandhi Sangrahalaya was previously the residence of Mahatma Gandhi’s good friend Revashankar Jagjeevan Jhaveri. The two-storey structure has now been converted into a museum that contains a few belongings of the father of nation. Visit this place to learn about Gandhi’s life and his legacy. Built in 1769, the St. George’s Fort was once a glorious fort in Mumbai. Today, it lies in ruins, but it still exalts some of its former glory. It was built in honour of King George and was used as an arms station and to protect the empire from attack. The famous St. George’s Hospital lies next door. The Crawford Market is a historic shopping centre in Mumbai. At this iconic market, you can shop for a variety of products ranging from cloth to food, birds and fruits. All the shops in the market offer their products at huge discounts. You can also find imported products being sold inside the market. Once you have finished shopping, head out of the market and make a pitstop at the iconic Badshah Falooda shop nearby. This iconic café and bar in Mumbai has a strong connection to Mumbai’s nightlife and culture. With its old school décor, wood furniture and clean white walls, the café is a famous hangout spot for foreign as well as domestic tourists. The place is famous for its beer on tap and chicken chilly. You may have to wait to get a table, especially on the weekends. Located in the suburb of Prabhadevi, the Shree Siddhivinayak temple is dedicated to Lord Siddhivinayak. The best time to visit this iconic temple is on a Tuesday when special devotions are held. Devotees from all over Mumbai walk to the temple to offer their prayers to God. It is believed that praying at the temple can grant miracles if you pray with faith. Located close to the Fort area of Mumbai, Colaba Causeway has always been a popular shopping street. For great gifts, trinkets, clothes and accessories at reasonable prices you must head here. Adding to the fun is the quirky and innovative ways in which sellers try to market their products. The Haji Ali is a mosque and a dargah located off the coast of Worli. Situated in the middle of the sea, this mosque was built in memoriam of Pir Haji Ali Shah Bukhari. Qawwali sessions are held in the afternoons at mosque and special prayers are held on Friday. The entire mosque is built in an Indo-Islamic architectural style. Situated inside a gorgeous building that was constructed using Indian, Mughal and British engineering styles, the Chhatrapati Shivaji Maharaj Vastu Sangrahalaya (Prince Of Wales Museum) houses important artefacts and relics relating to the history of India. A visit to this museum is a great experience to learn about India’s rich and glorious past. This religious monument is an awesome structure. Dedicated to goddess Mahalaxmi, the temple has idols of Laxmi, Kaali and Saraswati. It attracts many devotees who come to pray for wealth and prosperity. In the temple complex, there are small shops selling puja items and religious artefacts. Located in South Mumbai, Kamla Nehru Park is a must visit for anyone travelling to the city with kids. Surrounded by beautiful flowers and plants, the highlight at the garden is a giant shoe, which children can play in. The perfect time to visit the garden is in evening, when the sun is down and the temperature is a bit cooler. A great place for families and kids, the Jijamata Udyaan is Mumbai’s only zoo. At this place you can get to see animals such as lions, tigers, monkeys, alligators and deer. You can opt for a guided tour of the zoo, in case you are keen to learn more about the animals. A perfect place to relax, Hanging Gardens is surrounded by lovely flowers ands gorgeous trees. It is situated opposite Kamla Nehru Garden and is a popular meeting place for couples. In the evenings, many families visit here to enjoy nature and take long walks on the lovely walkways. 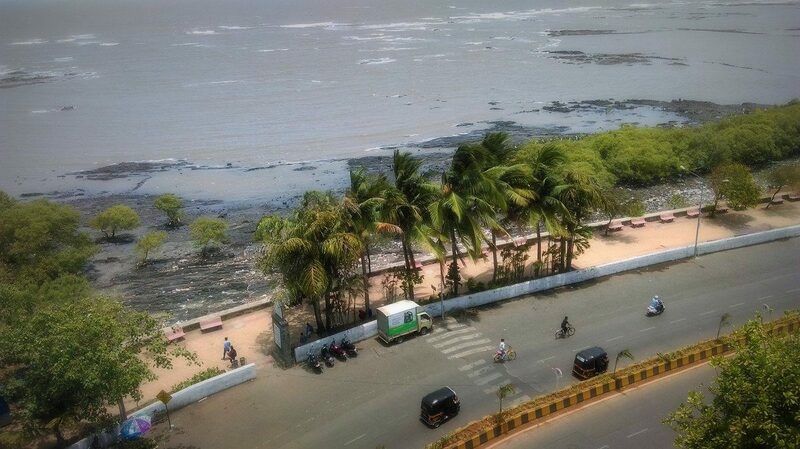 The Marine Drive begins from the north of Nariman Point and goes upto Worli. A famous place, here you will find a lot of people chilling out, especially in the evenings. Equipped with a promenade and many benches, visit this place to soak in the fresh sea breeze and to spend a few hours outdoors. Located in South Mumbai, the Wankhede Stadium is Mumbai’s biggest cricket ground. At this iconic stadium, you can catch cricket matches. The best time to visit is during the Indian Premier League that is held every year in April and May. Locals come to the stadium by the dozens to support their favourite team, the Mumbai Indians. 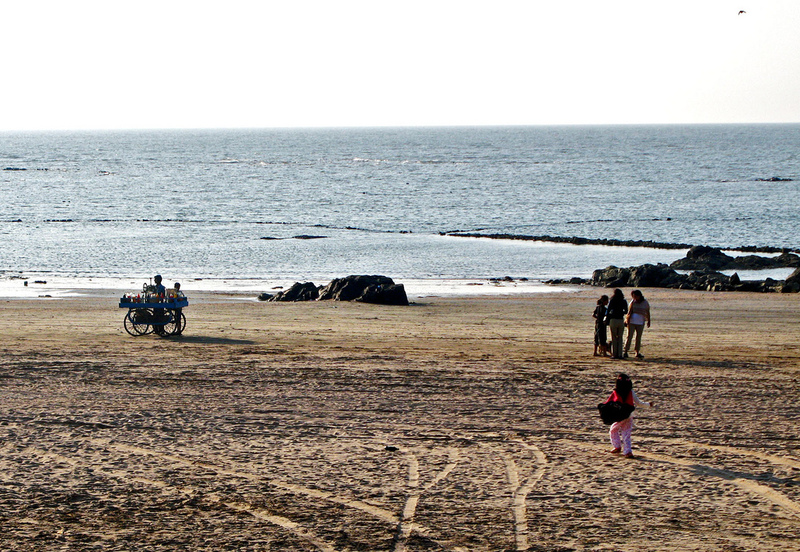 This beach is famous for its chaat and street food stalls. Go here in the evenings to enjoy long strolls and indulge in a variety of chaats. Swimming is not allowed at the beach so avoid going into the water. There are water sports that you can enjoy at the Juhu Beach. This usually takes place in the summer and Diwali vacations. Situated in the suburbs, the Prithvi Theatre is run by the Kapoor family of Bollywood. The iconic theatre has been the place where most of Bollywood’s bigwigs began their acting journey. If you are in Mumbai and have a few hours to spare, we suggest that you visit this iconic theatre to watch a play. Afterwards, head down to the cool Prithvi Cafe that is located within the premises. Also known as Mount Mary’s, this basilica is a prominent Roman Catholic church in Bandra. Situated near the sea, this church attracts thousands of devotees who come to pay homage and seek the blessings of Mother Mary. The best time to visit the basilica is during the Bandra fair that is held in the second week of September every year. A modern-day engineering marvel, the Bandra-Worli Sea Link is one of the coolest bridges in Mumbai. The only suspended bridge in the city, a drive through this is something that every tourist has to experience. The best time to drive through the bridge is at night, when the traffic is not hectic and the street lights are on. Popular with the young Mumbai crowd, a majority of this fort now lies in ruins. Located close to the Bandra Worli Sea Link, this place is frequented by couples, photographers and young folk who come to chill out near Lands Ends. Located in Bandra West, the Carter Road is the hangout place for locals as well as people from Mumbai. Post 6 pm, the place is packed with bikers, cars, couples, joggers and college students who come to chill out. With the best restaurants and cafes around and good street food options, there’s no better way to spend an evening in Mumbai. If you are a fitness buff, you can head to the Bandra Promenade for an evening walk. Gorai Beach is a great place to escape the hustle and bustle of Mumbai. This seaside village has many resorts and guest houses that are great for a short getaway. Gorai is conveniently located: to get to the beach from Mumbai, you can take a BEST bus or hire an Uber/Ola cab or take a regular cab from the city. A towering structure, the Global Vipassana Pagoda is a Buddhist meditation centre in Gorai. To get to the pagoda you have to take a ferry from the Gorai creek. Inside the temple is a meditation centre that is a haven of peace and silence. A visit here is a refreshing break from the noise and fast pace of Mumbai’s city life. The Sanjay Gandhi National Park has something for people of all ages; it’s got amazing walking trails, such as Shilonda, wonderful structures, such as the must-see centuries-old Kanheri Caves, as well as the opportunity for you to spot animals and birds. A great picnic spot for Mumbaikars. Located a little away from the city centre, Manori is a cool place for a weekend getaway or a picnic. There are many resorts and holiday homes located in the area that have all the facilities for a comfortable stay. The beach at Manori is pretty clean and you can enjoy playing sports on the hard sand. If you are looking to enjoy a few Mumbai favourites, you can find them at food stalls on the beach. To get to the beach you have to take a ferry from the Marve Beach that is across Manori. If you have visited these places before, we would love to know about your experience. What did you like about them? Did you find anything special? Tell us in the comments section about your favourite places to visit in Mumbai.